Modern vehicles have sophisticated energy requirements, and very sophisticated electronic consumers that need a stable, clean voltage supply. Already workshops are seeing obscure faults with electronic systems, including fault code errors, brought on by failing batteries. Traditionally, a failing battery would manifest itself by having insufficient power to crank the engine over and start the vehicle. Often more apparent in the winter months, when cold starts need more torque to overcome the friction of a cold engine, with thicker, cold lubricating oil. However, with modern vehicles, a failing battery is likely to produce a fault, of an unrelated nature, before this ‘non start’ symptom occurs. Battery technology has also progressed in line with the vehicle systems, and a different method of establishing the serviceability is now available, and more appropriate. Let’s take a look at this new generation testing technology, and how you can use it to provide better customer service through more accurate diagnosis. There are 2 traditional methods of checking a wet, lead-acid, vehicle battery. The first is State of charge (SOC) which can be determined via measuring the specific gravity (SG) of the electrolyte in each cell with a hydrometer (but there is also a less accurate option, to measure the battery terminal voltage). Assuming the battery is reasonably well charged (>75%), then the performance test, indicating state-of-health (SOH), can be executed via a discharge test. This test is performed using a high rate discharge tester, with the appropriate load according to the battery capacity, and it would indicate the battery capability to supply a large current (as would be required under starting conditions). From these measurements, an experienced technician could make a judgement on the battery fitness for purpose. Why are these test methods no longer applicable? Many modern battery types (VRLA, AGM, Gel) have no access to the cell electrolyte, thus hydrometer readings are simply not possible, although the battery may have a built in hydrometer, this is of limited use, it’s just an indicator. In order to execute a high-rate discharge test, the battery has to be disconnected from the vehicle – this can present time consuming problems for the technician e.g. lost radio codes, ECU memory loss etc. There are health and safety issues, wet batteries contain acid, and generate volatile gases. High rate loads tests can create sparks and heat. All potential nightmares in a safety conscious, workshop environment. The measurements still rely on the knowledge and experience of the technician to make a judgement on the battery SOH. This is subjective and could be the source of inaccurate diagnoses. Along with the progress in battery and vehicle technology, technology developments have also provided alternative methods in battery testing. Mainly in the form of battery testers that use a completely different approach to evaluating the battery condition, providing an objective measurement of battery condition and capability, along with a more accurate SOH assessment. These testers are intelligent units, with built in, menu guided test procedures. 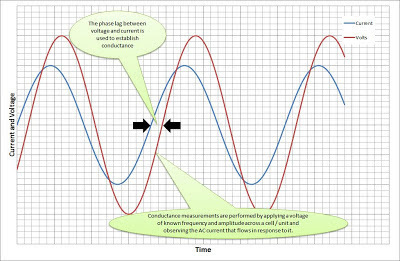 However, the biggest impact is due to the measurement technique itself – a conductance measurement. The conductance test is a completely different method of establishing the battery condition and performance, and is ideally suited for modern vehicle battery test applications. It can also though be applied to older, wet lead-acid batteries as well. So, how does it work? 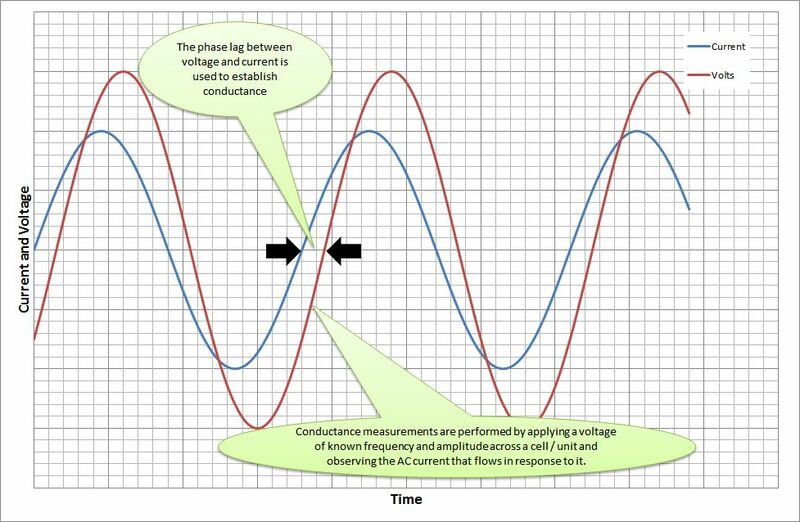 The conductance tester applies an AC voltage, of known frequency and amplitude across the battery terminals, and monitors the subsequent current that flows with respect to phase shift and ripple. The AC voltage is superimposed on the battery's DC voltage and acts as brief charge and discharge pulses. This information is utilized to calculate the impedance (measure of opposition to alternating current) of the battery, and from this the conductance value can established (impedance and conductance have a reciprocal relationship). A conductance measurement provides a measure of the plate surface area, and this determines how much chemical reaction or power the battery can generate. It has been proven by experiment that a conductance value has direct correlation with the batteries capability to provide a current, which is normally specified via a Cold Crank Amps rating (CCA), but it is also a good indicator of battery state of health (SOH). 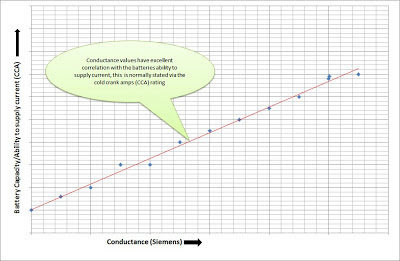 Taking into account temperature and other parameters like age, chemistry etc. this test can accurately form the basis of an objective condition evaluation, and can be used as a reliable predictor of battery end-of-life. 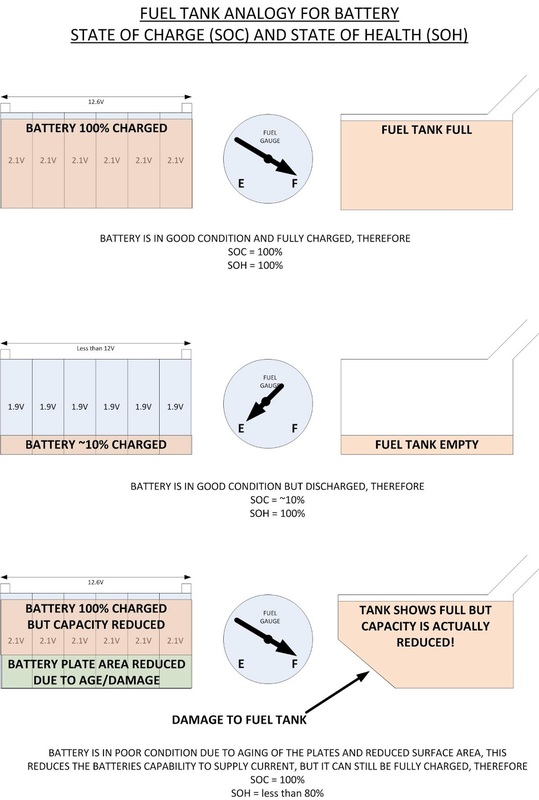 In order to provide a better understanding of the concept of the information provided by a conductance test, take a look at the comparison with a fuel tank. A healthy battery, when fully charged, can be compared directly to a full tank (i.e. full capacity). 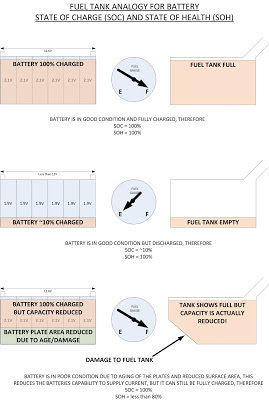 When discharged, it’s the same as an empty or low fuel tank (i.e. low capacity). However, when the battery has aged and SOH has declined, the reduced active plate surface area causes an effective reduction in the current supplying capability. Comparing with the fuel tank, this would be comparable to damage to the fuel tank, which has reduced its volume (for example, a large dent in the tank). So, even if you fill the tank, and the gauge shows full, the actual capacity of the fuel tank is reduced. 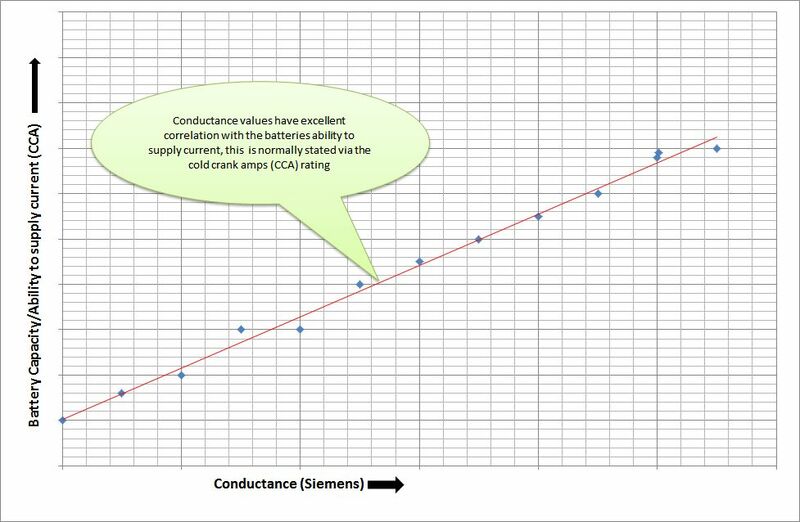 The conductance tester is an accurate, repeatable method. The tester can be applied to a connected battery in the vehicle. The test method is much safer for the operator and the vehicle. The result from the test is much more objective and factual. The tester can be applied to many modern battery technologies, and this is particularly important as battery technology is currently changing and adapting to new demands and load profiles generated by the latest technologies to reduce vehicle tailpipe emissions, namely stop/start and energy recovery technologies. This is an addition to smart energy management and battery charging systems, already seen in service on many current vehicles.